Almost all of the 34ft. 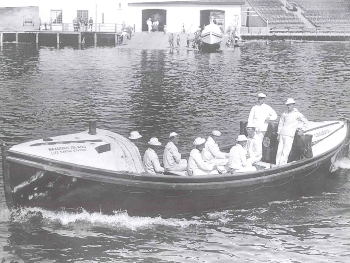 Merryman type motor lifeboats were conversions of previously-built pulling/sailing version lifeboats, with the first conversion in 1899. Self-righting and self-bailing. Dimensions: 34ft. overall length, 8ft. 1.5in. maximum beam, 3ft. 11.5in. depth; 3 or 5 thwarts for 6 or 10 oars rowed in double-banked configuration; two-masts with sprit sail rig of jib, foresail, and mainsail; single 2-cylinder/2-cycle, 400 RPM, 12 HP “Superior” gasoline motor with twin shafts or single shaft; maximum speed 7.5 Statute MPH, 275 nautical mile range; double-diagonal planked wooden hull of Honduran mahogany planks over white oak frames. 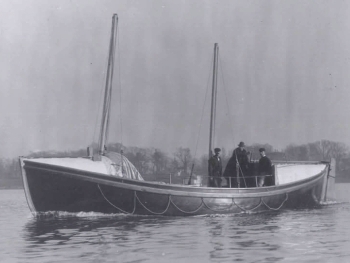 Design developed by CAPT Charles McLellan, USRM, with nearly all boats built by the Electric Launch Co., Bayonne, NJ starting in 1908. Self-righting and self-bailing. Dimensions: 36ft. 0in. overall length, 8ft. 7.5in. beam, 4 ft. 2.5in. depth from skin to gunwale amidships; 8 tons displacement; single 6 cylinder, 4 cycle Holmes Automarine gasoline engine of 35-40HP and single propeller; maximum speed just under 10 statute MPH; sailing rig of two masts with foresail, mainsail, and jib plus fore-and-aft lug sails; five thwarts for 10 oars rowed in double-banked configuration; double diagonal planked wooden hull of Honduras mahogany over white oak frames.